The ambitious legal assistant Tom Miller (JJ Feild) works at the Rosen, Byres and Emmerich Attorneys at Law and secretly dates the gorgeous clerk Anna (Eloise Mumford). His company has presently two major cases: Hartcourt vs. Denning Pharmaceutical, against a powerful corporation, and Gambizzi Case, against a mafia family. On the eve of the judgment of the Hartcourt case, Alan Emmerich (Christian Clemenson) releases all the employees early in the afternoon and he also fires Tom for snooping around the Gambizzi case. 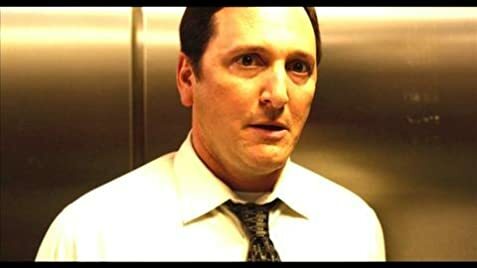 When Tom is leaving the building with Anna, he sees a man leaving a suitcase on the floor and another man wearing a suit taking the suitcase and going to the 34th floor of the building. Tom decides to follow him and soon he discovers that he man is actually a hit-man. Soon Tom is trapped on the floor with the killer since his access card is deactivated. Who hired the hit-man? "Not Safe for Work" is a low-budget thriller that works reasonably well. The beginning is too rushed, with little explanation about the cases that the company is working. The mouse and cat game between Tom and the killer has few moments of tension, and a total lack of humor. Unfortunately the conclusion is predictable. My vote is six. This movie was originally supposed to be released in 2012. Alan Z. Emmerich: No, I am not a killer. Thomas Miller: No, you just pay other people to do it for you. It's easier.